Truck batteries with high endurance for professionals. SIGA Truck Batteries impress with innovative know-how and provide customized starting power for new and older models. Whether a truck in local or long-distance transport, buses, construction or farm equipment: with SIGA Batteries you get performance and reliability for professional use. 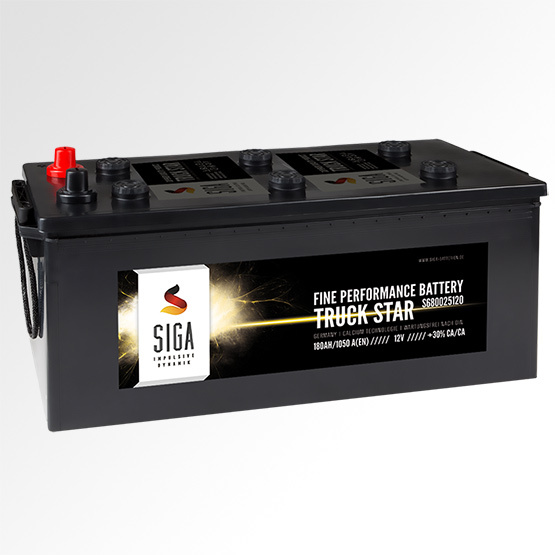 SIGA Truck Batteries includes a full range of EN types. The commercial vehicle batteries are offered as TRUCK STAR (standard version), as OPTIT RUCK (for quality and durability), and as a Truck Dry (dry charged) for long service life.